It’s a big problem if consumers have no idea what your business does. How can you sell a product that no one understands? Especially a new or more complex offering. That’s where our animated explainer video process comes in. But first, let’s talk about our amazing client PerkinElmer who had this exact problem. PerkinElmer’s Clinical Analytics group has experienced this same challenge with awareness of their clinical analytics and visualization solutions. PerkinElmer is widely known in the life science industry for leading solutions for diagnostics, detection, imaging, and instrumentation. 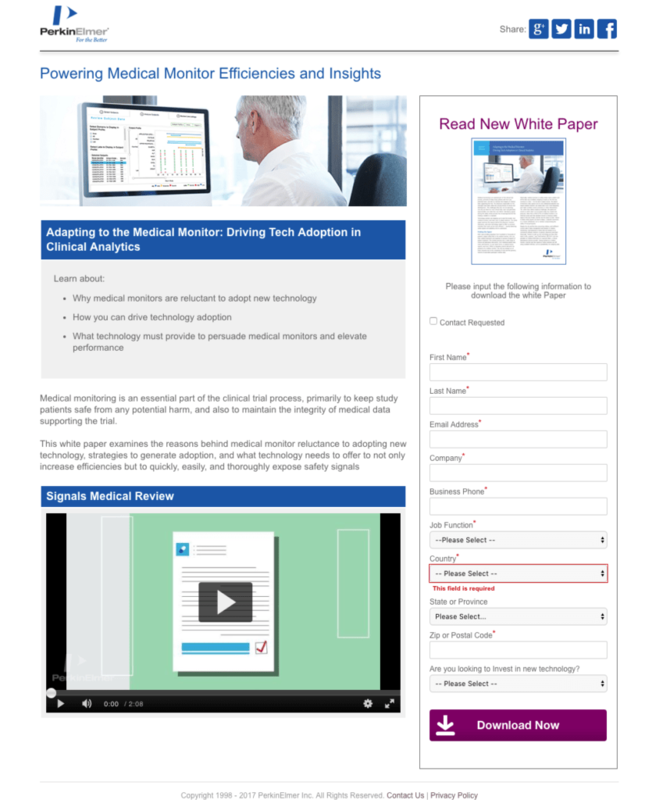 PerkinElmer’s Informatics offering is quite new and less known throughout the industry. They needed a way to drive global awareness of the analytics solutions for the clinical domain directly. 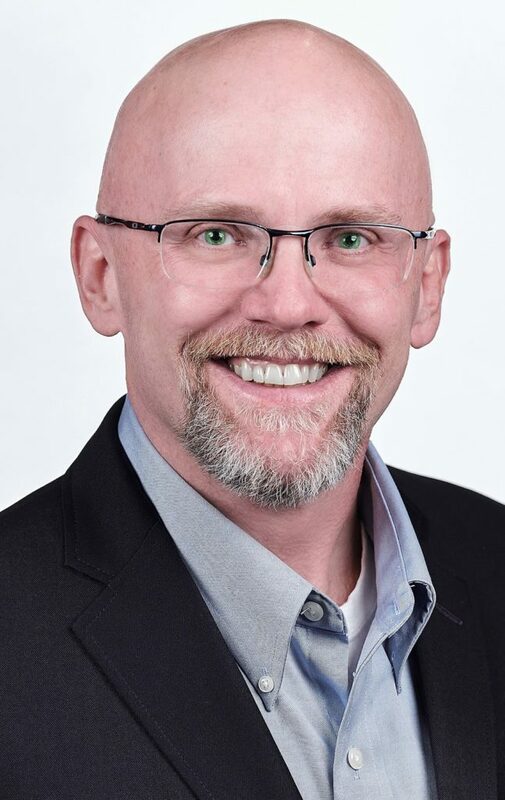 We talked to Rob Rittberg—a Global Marketing Manager for PerkinElmer’s Clinical Analytics team—to learn more about the strategy the company is using. As Rob told us, PerkinElmer turned to explainer videos to help educate the market about the new product and to build awareness. Here’s PerkinElmer’s recipe for using those animated explainer videos at the top of the funnel to drive product awareness and nurture leads into their funnel, including three specific use-cases for their videos. A flashy animated explainer video isn’t worth much if it doesn’t work with your overall marketing strategy. Video is a tactic, a tool that can help nurture and convert leads—but it can’t be your entire strategy. PerkinElmer needed a way to speak to the top of their funnel, to drive product awareness and grab people’s interest. Animated explainer video doesn’t work for them because “video marketing is the future.” They work because video helps to communicate the benefits of their new solutions. “I want people to watch the video and think ‘These are some of the challenges I have. I want to learn more,’” Rob told us. There wasn’t a playbook for how to use video at the top of your marketing funnel, so PerkinElmer made their own. They did a lot of experimenting to find the right way to use video to move prospects into and through the funnel. For PerkinElmer, content marketing meant more than just adding a blog to their website. It meant sharing their blog content, articles, and an animated explainer video to well-known media outlets for the life science and pharmaceutical industries. Publishing animated explainer videos on your own blog is great, but if you put all your eggs there, you’re limiting the potential of your video marketing. At the top of your funnel, people haven’t even heard of your brand, so they’re less likely to click on your blog in Google results. Learn where your target audience is searching for information, where they go to find information they can trust, and find a way to be there. Understand what they’re searching for and design your video strategy around answering those questions. This tactic helped boost awareness of PerkinElmer’s newer solutions and get new leads to associate the brand with that type of product. They know people search online for topics such as risk-based monitoring, medical review, clinical analysis, and similar topics, so they created an explainer video about it. Now people who search for those topics are introduced to that side of PerkinElmer in a low-stakes setting that’s educational and designed to help, not sell. PerkinElmer knew one of the first places customers find their solutions is through search ads. They use Google AdWords to drive leads to their website, landing pages, and gated content—and you’ll find animated explainer video on all three. “Our videos do really well on the landing pages,” Rob noted. “Sometimes even better than the call-to-action or form itself,” he added. Here’s why it works: at the very top of the funnel, not everyone is ready to fill out a lengthy form—even if they really do want to know more about your products. On your landing pages and anywhere else you ask for information from visitors, animated explainer video can help you create visceral interest before progressing toward greater qualification. They let people learn a little more about the company and solutions they offer, so they’re more engaged and comfortable when they hand over their information. The third branch of PerkinElmer’s video strategy is Rob’s bread and butter: his email nurture campaign, which helps the team identify and qualify prospects as they move through the sequence. The nurture sequence has been a flagship tactic for PerkinElmer. At the top of the funnel, the marketing strategy is all about approaching and educating the audience in a low-risk way—so they feel comfortable engaging with the company and indulging the desire to learn more. That’s where the nurture campaign starts. It’s designed to meet people where they are—when they first agree to subscribe—before moving them along to the middle of the funnel. Rob uses several explainer videos throughout the sequence to help simplify complex solutions, illustrate the visual aspect of analytics, and concisely highlight the benefits their solutions offer in an engaging way. The first video is sent in the very first email. If the recipient clicks to view the video, they move forward in the email sequence. If they don’t they get a reminder email with another suggestion to watch the video. Too many companies make the mistake of moving straight to the hard sell as soon as someone agrees to subscribe. You want to shorten the sales cycle, and we get that. 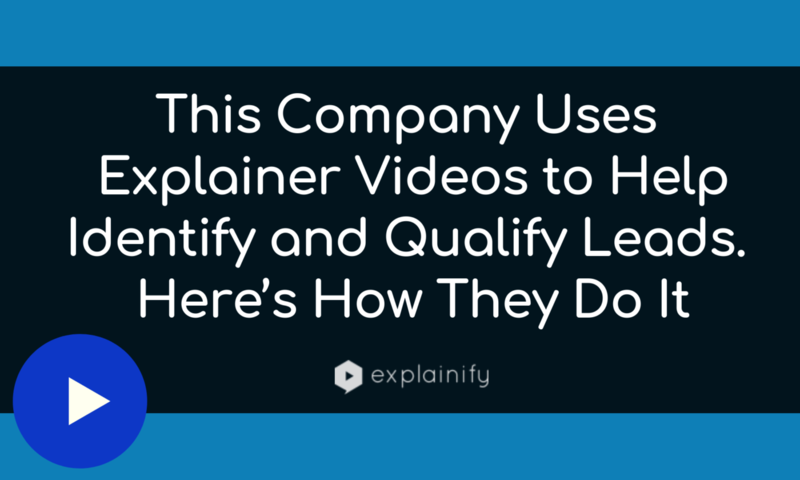 Using an animated explainer video in your email nurture is a less abrasive and more valuable way to do that, especially at the beginning of your sequence. You can share a whole lot more information in a more compact package, so leads get your value proposition without having to scroll through miles of text. Videos, to be successful, have to be a part of a broader marketing strategy and they have to adapt to a changing audience and business goals. That’s the driving force behind PerkinElmer’s video awareness campaigns. You have to be looking for ways to improve your videos and how they’re implemented. Our next step is to see how we can use video in an even more strategic way. When they first started using video to raise awareness, PerkinElmer used them for in-person events like conferences and webinars, too. They learned people won’t stop and watch a video for longer than 30 seconds at events like that—so they adapted their strategy. The next step, Rob shared, is to explore other ways they can leverage video, like adding a CTA directly into the video itself and experimenting with videos designed for the middle of their marketing funnel. Need a high-quality animated explainer video and a smart strategy for how to use it? Chat with us to see if we’re a good fit for your business.